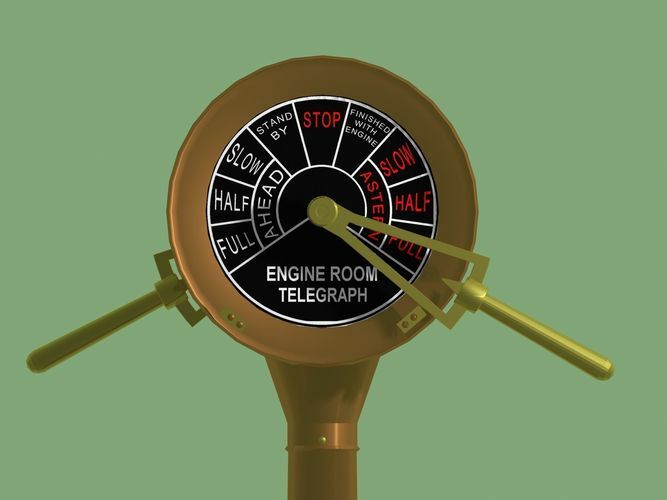 These types of engine order telegraphs have been is use since the 19th century until the 1950s when they began being replaced by electronic devices. They were used to communication orders from the bridge to the engine room with specific regard to engine speed. Most ships and navies of military and merchant types around the world used similar devices. This model is generic with two faces - the one serves to reflect acknowledgement of the order by the engine room. Some ships were equipped with single faced telegraphs. Most U-boats telegraphs were wall mounted.There are numerous configurations of faces. Included with this model are three face textures 1. generic British ship. 2. US Coast Guard cutter. 3. WWII German Kriegsmarine. They were typically brass or bronze, but aluminium ones and combinations of metals were also to be found.